WELCOME TO MY MONEY MISSION ONLINE: WONDERFUL WEDNESDAY MOM MINUTES! GOOD MORNING!! The sun is shining, the birds are singing, the kids are still sleeping (yeah! ), and it is time to post this week's MOM MINUTES!! YES!! The day doesn't get any better than this!! 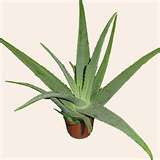 "Many of you probably have an aloe vera plant in your kitchen. Not only are they good for burns and minor skin irritations, but did you know that they can also be very handy to use for drying out those plastic bags that you wash and want to re-use?? Yes, that's right. Those strange-looking aloe vera leaves are excellent bag holders. Just wash and rinse your ziplock bags, put them over the leaves, and in a little while, your bag will be dry!! The moisture is what the aloe vera plant loves. It absorbs the moisture from the bag and dries it out. So, you have a happy plant and a now dry, ready-to-use bag." Isn't that a great tip?? My mom learned this tip from my Aunt, many years ago, and it really works. Give it a try and tell me what you think!! For those of you who love shopping at Walgreens, if you signed up to receive info, by e-mail, check it this morning. My sister and I both received a $5.00 off $25.00 offer. It is good only Wednesday, May 20, and Thursday, May 21. My sis is excited, since she is going to go there after work. So, check your e-mail and see if you received it!! OH BOY, OH BOY, DOING THE HAPPY DANCE, DOING THE HAPPY DANCE.....I just got back from taking the teen son to school (navigating the street in front of the high school is like a daily brush with death....), and I was checking my blog and I HAVE A NEW FOLLOWER!! WHOOP....WHOOP!! I'd like to give a BIG WOO-HOO WELCOME to JOOPS over at sailors musings. He is a Dad Blogger, and his site is really cool. He has posted some adorable pics of his children; you'll have to "sail" over there (pardon the pun...I couldn't resist! :):) and check it out!!!! Nicole's" Nickels: Arby's FREE food (with purchase) Wednesdays! I need to try the aloe plant tip. Right now I use a baby bottle drying rack, which works, but it takes a very long time for the bags to dry sometimes. Now I am going to try and find an aloe plant!!! Tell mom thanks for the tip!! I'm telling ya- Mom needs her own blog! SonyaAnn...I'll tell my Mom; she is already amazed that anyone would want to read her tips. I told her she has a fan club, and she gets all modest! Hi Annie Jones and MammaYoung!! Thanks for leaving a comment. All of these comments just make my Mom's day!! :) She's already working on next week's tip!! Great tip with the aloe vera plant.